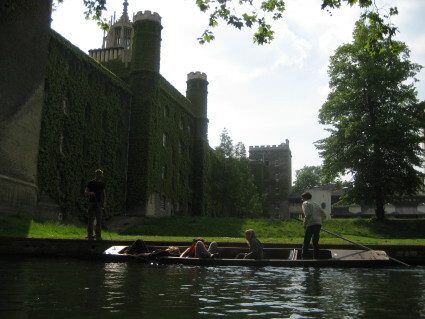 Yesterday, Evan’s parents and I took the train out to Cambridge. It was only about 45 minutes away from London on the express train, which made for an easy trip, and we took a taxi into town since it was a bit of a walk from the train station. The first thing we did was take a walking tour offered by the visitor’s center. Our guide, who knew a ton of trivia — much of it likely town lore — showed us around town, took us to a few of the colleges, including Trinity, where we got a nice glimpse of the courtyard, and King’s, where we got a tour of the immense chapel, which is strangely devoid of much religious iconography in favor of having kings’ and queens’ crests, symbols and initials around. It also had some very old graffiti from the English Civil War, which was interesting. The tour ran a bit long — the guide sure liked to chat! And afterward we took a bit of a break for lunch. After lunch we were on our own. 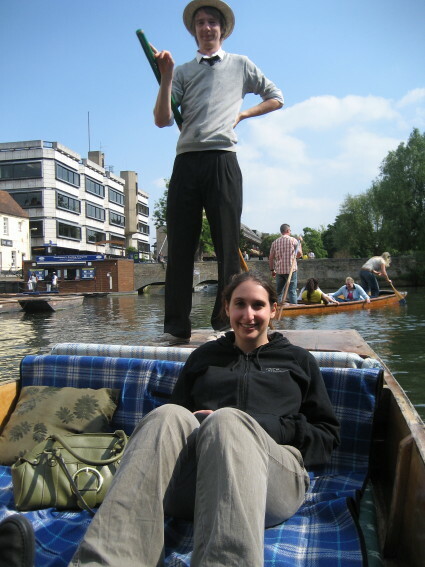 We walked down to the River Cam and hired a friendly punter to take us on a river tour, which was relaxing and a lot of fun. He knew a lot about the city, answered lots of our questions and did a good job of maneuvering around the less experienced punters. We also helped two people get their poles back. 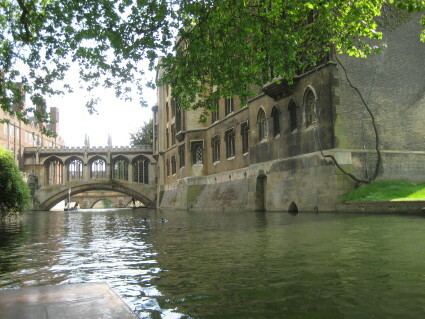 And remember the Bridge of Sighs from Oxford that went over the road? 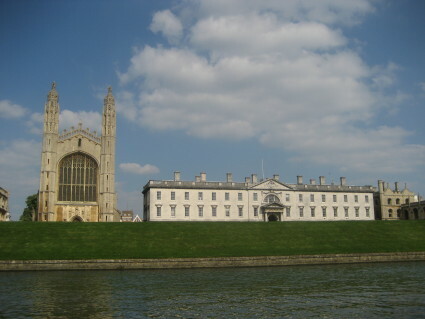 Cambridge has another version, though it’s not quite as ornate, doesn’t have glass and actually goes over the river. I’m guessing that it’s a just a common bridge name at this point because though tour guides like to claim they’re replicas of the one in Venice, neither looks anything like it. Unfortunately, we were visiting during exam time and most of the colleges were closed to visitors, so we didn’t get to really spend any time exploring them. We spent a bit more time walking around town, but it was after 5 and most attractions seemed to be shutting down, so we walked to the train station and headed back to London.